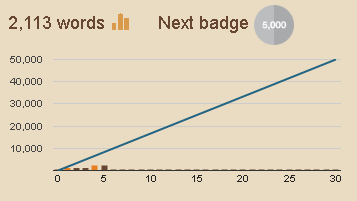 So… Tuesday was the first day of NaNoWriMo. I started at 12:00 midnight without any theme or genre or idea. I decided to start writing an original cyberpunk novel, but in a setting similar to Neuromancer. While I was writing I tried to avoid cliches and anything resembling Blade Runner, Sprawl or Matrix. After 600 words I ended up with a crap story that didn’t arouse interest in me. The next day, still under the 24-hours of the Day 1, I wrote again. I gotten something around 1080 words and stopped. Shame, I wasn’t able to keep moving forward. Friday I tried to improve some of the existing dialogue and characters. It helped to increase my word count a bit, but the novel was still unexciting and way far from the goal. That killed the rest of my motivation. I will keep writing and keeping track of my word count, but I will not crave to win the challenge this year. Maybe my first try was too hard as I was writing in a fictional setting with a bunch of made up gadgets. Not schedule a strict writing time. No planning (Setting, characters, and any other background information). Decide the theme on short notice. Back in 2014 I was willing to participate of NaNoWriMo and even created my account with a pseudonym, but I chickened out in the last moment because I was overwhelmed with work. For those who have never heard of, NaNoWriMo means National Novel Writing Month. It’s an annual challenge where writers put together 50,000-word novels from November 1 until the deadline at 11:59pm on November 30. There are no prizes except the contentment and pride of successfully completing the challenge. I still don’t have defined the genre and theme of my novel, but I chose to write in Portuguese. I am using this year NaNoWriMo to have idea of how I can handle the contest and my time schedule. Next year I plan to write something more serious and intense. There will be a post every Friday here informing my word count and how I am dealing with the pressure of writing.